Historians have quite rightly pointed out that the extermination of the Jews of Europe was well underway by the time the Grand Mufti of Jerusalem, Haj Amin al-Husseini, met Adolph Hitler in 1941. But most disturbing is that, among the chorus of political opponents and Palestinians accusing Netanyahu of distortion and even ‘Holocaust denial’, there are those who are irresponsibly introducing another dangerous distortion into the historical record. They are whitewashing the Mufti’s active role in WW 2 and his enduring legacy of genocidal antisemitism. I repeat, Israel’s Prime Minister Netanyahu was wrong. However, it is beyond doubt that the Mufti did everything possible to encourage the Final Solution. When the Nazis wavered, he ensured that expulsion was not an option. Each time a German was bribed to free Jews from the camps, the Mufti intervened to block the deal. He sabotaged the exchange of at least 1,200 Jewish children for German PoWs and sent them to their deaths. He was indirectly responsible for condemning millions of Jews to death by making sure the gates to a safe haven in Palestine were firmly shut. Exiled to Baghdad by the British, the Mufti helped engineer a pro-Nazi coup in 1941 and the resulting ‘Farhud’, Iraq’s ‘Kristallnacht’, in which up to 600 Jews may have been murdered. Had the Nazis won the war, the Mufti, who as a captain in the Ottoman army would have witnessed the Armenian genocide, would have become a major player in the extermination of the Jews of Palestine and the Arab world – an objective for which he sought approval at his famous meeting with Hitler in November 1941. He had detailed plans for incinerators near Nablus. He laid the groundwork for the Holocaust of the Jews in the Arab countries. The Mufti was the tip of an Arab and Muslim pro-Nazi iceberg – some 60 Arab acolytes joined him in Berlin as guests of Hitler. He was not just a propagandist – although his broadcasts had a huge impact. As the leader of the Arab world, he commanded immense support for his pro-Nazi antisemitism. So popular was Hitler that a favourite slogan in the Arab world at the time was:’Allah in Heaven, Hitler on earth.” The Fuehrer was known as Haji Hitler. Some even claimed that Hitler was an Egyptian. My mother, growing up in Baghdad in the 1930s, was mortified to learn that the family’s Muslim gardener had named his new baby Hitler. Fifteen times more Jews than Arabs in Palestine ( there were half as many Jews) fought Hitler alongside the Allies. Those who claim that Bibi singled out the Mufti from among hundreds of Nazi fellow-travellers and antisemites to ‘delegitimise’ the Palestinian cause ‘for political gain’ are engaging in ‘Mufti denial’. How many antisemites went as far as the Mufti and recruited tens of thousands of Muslims to his three SS Balkan Muslim divisions? They committed crimes so unspeakable that Yugoslavia demanded that the Mufti be indicted at the Nuremberg trials. According to Dr. Yosef Sharvit, the Mufti was even considered a greater Nazi criminal than Adolf Eichmann. The failure of the Allies to bring the Mufti to trial meant that the Arab world was never de-nazified. Instead, 2,000 Nazi war criminals were given shelter in the Arab world, there to take antisemitism to stratospheric heights. Antisemitism is not a by-product of the Arab-Israeli conflict: it has deep ideological roots. 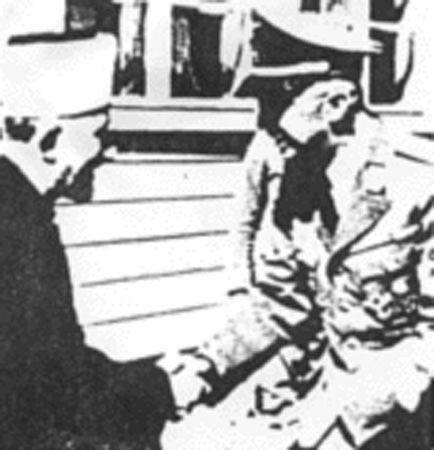 The Mufti’s alliance with the Nazis and with the German-funded Muslim Brotherhood, founded in 1928, was not a mere matter of anti-colonial expediency. Their legacy of religious bigotry is still with us today, in the beheadings committed by Da’esh in Iraq and in the stabbings on Israel’s streets. Some good may come out of the current controversy: more people may be moved to focus on the Mufti’s hugely significant role, a role that academia and the media have hitherto been inclined to ignore or downplay. "The truth is that Hitler had already launched genocidal plans before meeting with the Mufti, though the Mufti may well have wished for a genocide of the Jews." Not a full whitewash but no mention of the Farhud or of Husseini and his pan-Arab committee in Baghdad asking Hitler to recognize the Arab right to solve the Jewish question in Arab lands as it had been solved in Germany, etc. No mention of Husseini's pleasure when Hitler told him he intended to destroy the Jews in Arab lands after the German forces had crossed the Causcasus. And last but not least, the Mufti's letters to Axis leaders asking them to send Jewish children to Poland where he knew the death camps were located. To Koplow, Husseini was somehow connected to Hitler, voiced vocal support for hitler and met hitler. Nothing more. This is a gross whitewash, although subtle to be sure.